We've really enjoyed watching the Winter Olympics the last few weeks and can't believe it's ending so soon. Bubba hasn't much enjoyed us watching the Curling (I feel old for admitting I've been gripped by this but it's so darn watchable) but she likes a bit of skiing and skating. She pretends to ski on a couple of squidgy ice cube trays that she used to use as skateboards! We'd love to take her to a winter resort next year (not this year as I'm fit to burst and don't fancy lugging a newborn around in snow). Hubby hasn't been skiing before either and with his lack of coordination it would make great blog fodder! 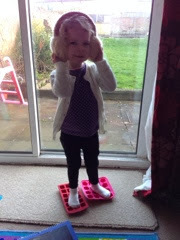 I will definitely be taking her ice skating around Christmas time this year as she is reaching the right age to give it a go (and she is turning into a daredevil). I've been both dry slope skiing and also to Switzerland where I first learnt to Ski and look forward to going again in the future with my little family. My dad and brother also enjoy a bit of winter sport but haven't been able to get away as much due to both being self employed so I'm going to suggest they work on holiday and then we could all hit the slopes together (or I could leave them to it, find myself a hot chocolate and watch some live curling)!